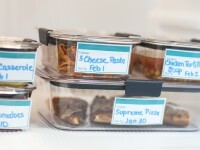 Need a way to store your greeting card supplies? 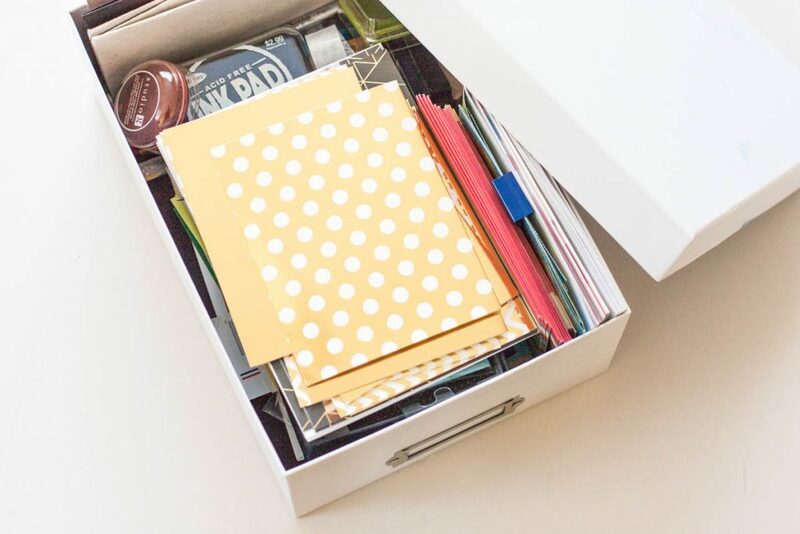 Make this simple greeting card organizer from a shoe box! One thing I love to do is send snail mail. I’m not great at remembering, but I get such joy out of writing a little note to a friend and slipping it in the mailbox. Picturing their smile when they open that unexpected letter makes me so happy! In a world with far too few handwritten letters and far too much junk mail and bills, it’s nice to brighten someone’s day with a colorful greeting card for their birthday, a holiday or just because. I was decluttering my office supplies recently and organized all of my greeting card supplies into this shoe box! Avery sent me their new Ultra Tabs® to review. 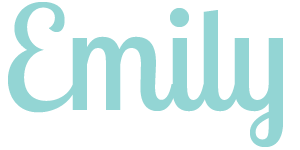 All opinions of their quality office supplies are 100% my own.This post contains affiliate links. See my disclosure policy for more information. 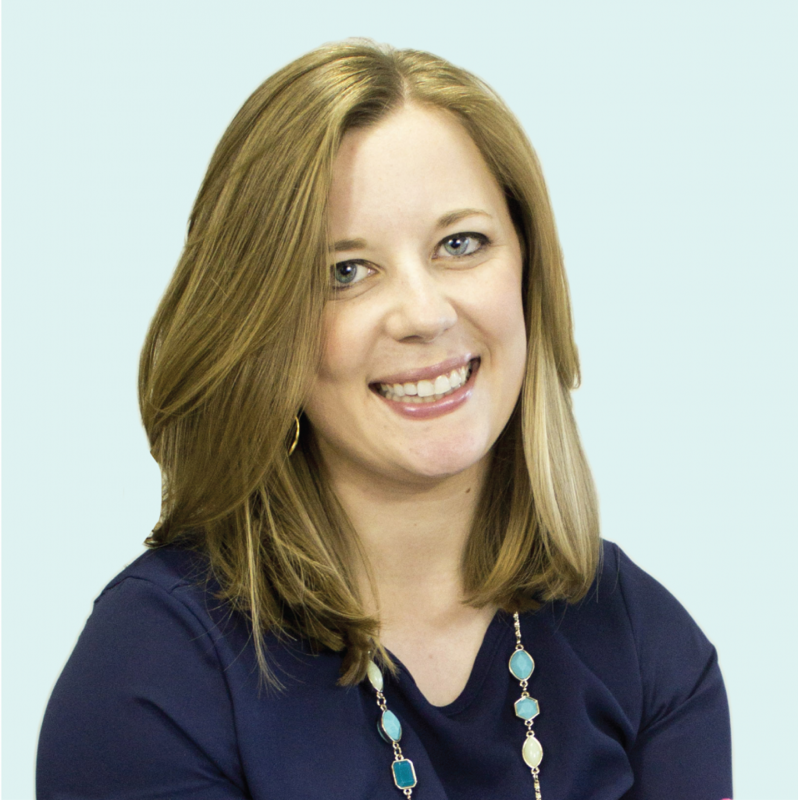 One of my very first blog posts (more than four years ago!) 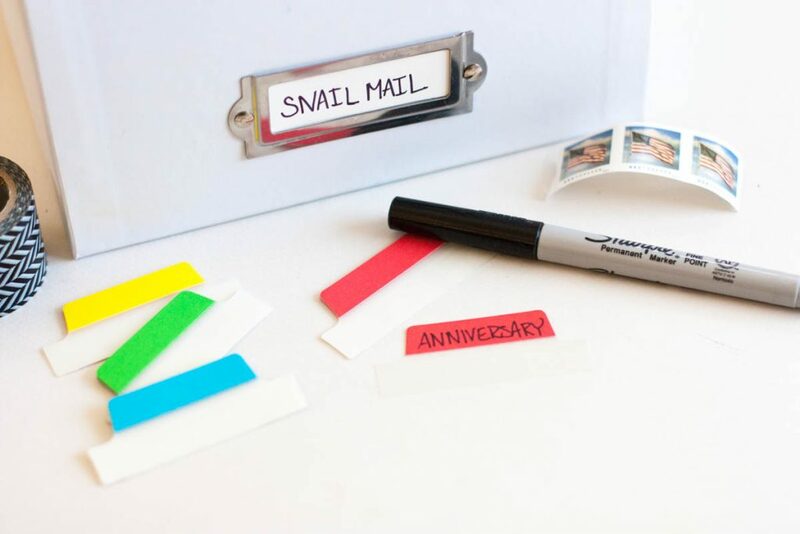 was about my organized snail mail box, and I still use the same method today! 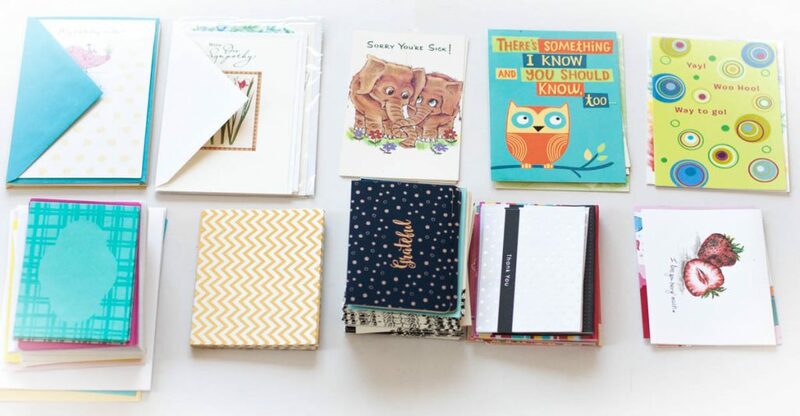 I love having all of my greeting card supplies in one place so it’s super easy to mail a quick birthday card or thank you note. And storing all of my greeting card supplies in one little shoe box makes it easy to carry around the house which is nice since I love to write letters on the patio or the couch. After years of use, it was time to declutter this shoe box and I decided to improve the organization inside it as well! I pulled everything out of the box and purged a lot of it! Then it was time to organize what was left. 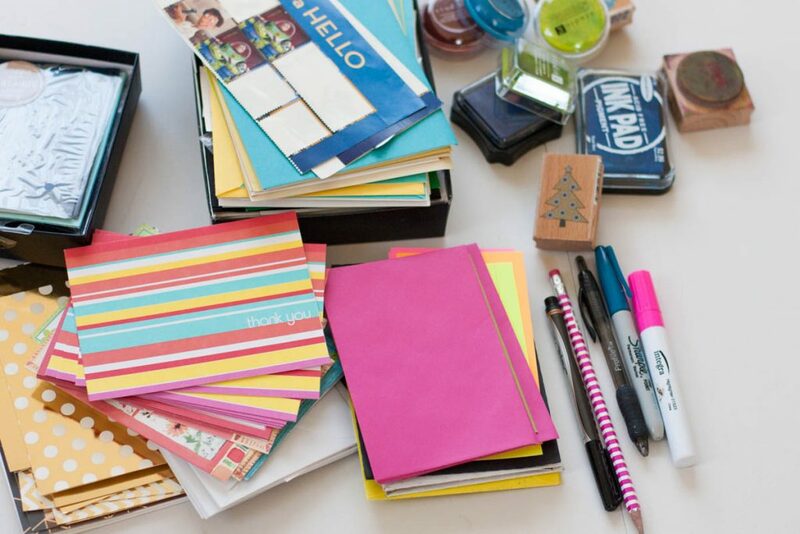 To make your own greeting card organizer in a shoe box, you’ll first need to gather the following supplies. I always load up on greeting cards at the dollar store so I have a variety in my stash. It’s so much easier than trying to remember to purchase a card every time you need one. The rest of my supplies generally come from Michaels or Hobby Lobby. Divide all of your greeting cards into piles by occasion. 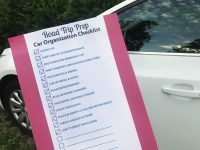 This is a great way to see what you have and identify any occasions you may want to stock up on. For example, I have a ton of thank you notes and birthday cards but realized I don’t have any anniversary cards and few sympathy cards. 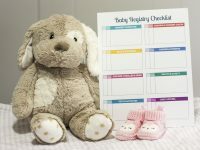 Brainstorm a list of the occasions you will likely need greeting cards for during the year and stock up accordingly! I also like to have a couple sets of blank note cards for general notes to friends or to use in a pinch when I don’t have a card for a specific occasion. 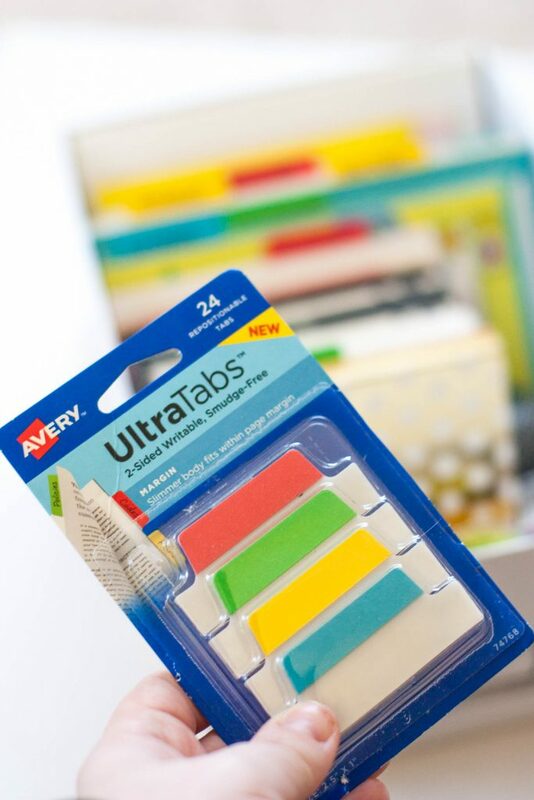 I used these colorful Ultra Tabs to divide my greeting card organizer into categories. 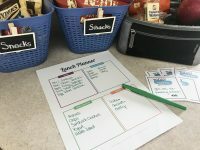 It’s so quick to handwrite your categories on these tabs and they are designed to be smudge-free so you don’t have to worry about the ink smearing. 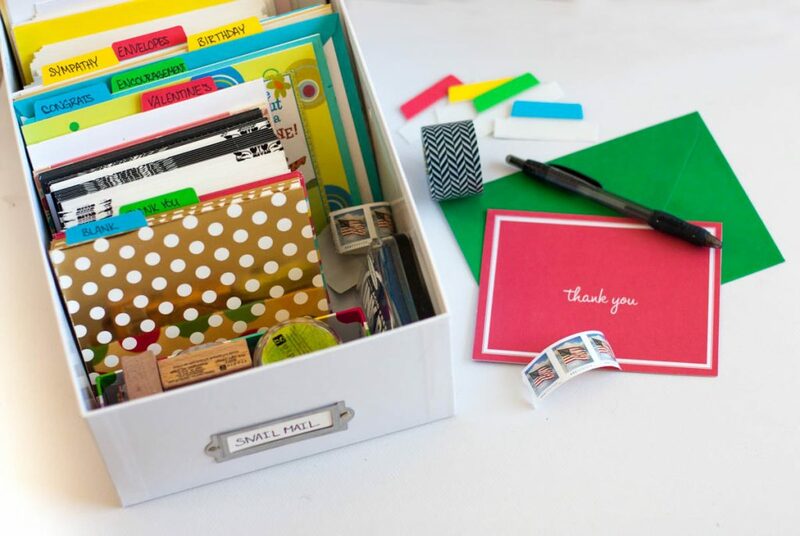 Now it’s time to organize your greeting cards inside the shoe box and add tabs to divide each section. I thought about creating dividers out of cardstock or cardboard, but ultimately decided to keep things simple by sticking the label to the first greeting card in each category. Since the Ultra Tabs are repositionable, it will be easy to move them to different cards when needed. I put the sections in order according to size of the greeting cards, with the smaller thank yous and blank note cards at the front. I generally like to keep envelopes paired with the cards they come with, but I added extras to the back of my greeting card organizer. 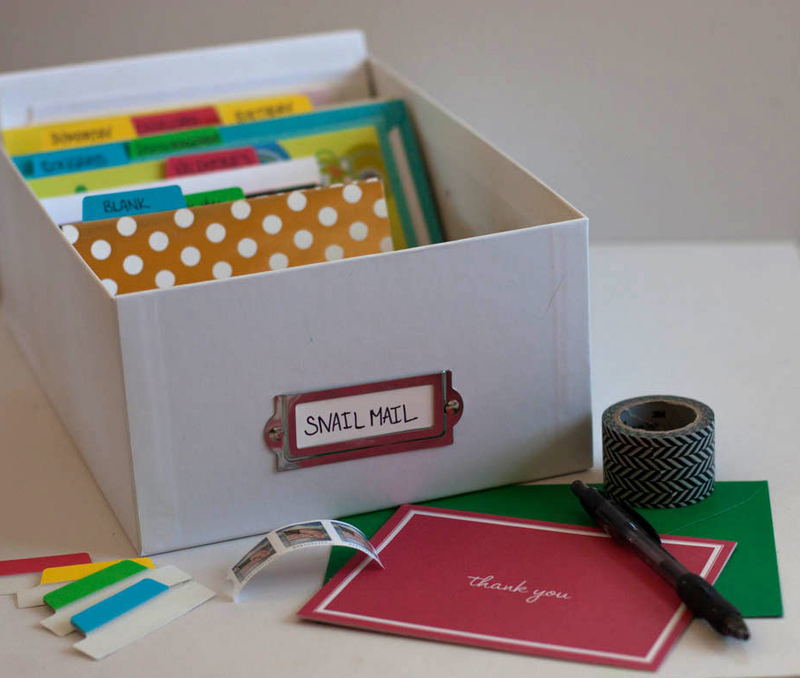 Once all of your greeting cards themselves are organized, use the rest of the space to store the rest of your snail mail supplies. I placed a skinny box in the front to hold a couple rubber stamps and ink pads. Then I tucked a roll of stamps, a couple pens and some return address labels along the side. It’s nothing too fancy, but it works! You could also corral all of these items in a small pencil case and tuck that inside the shoe box. And that’s all there is to it! Quick organizing projects like this are perfect for those days when you don’t have a lot of time to tackle a whole closet or room. 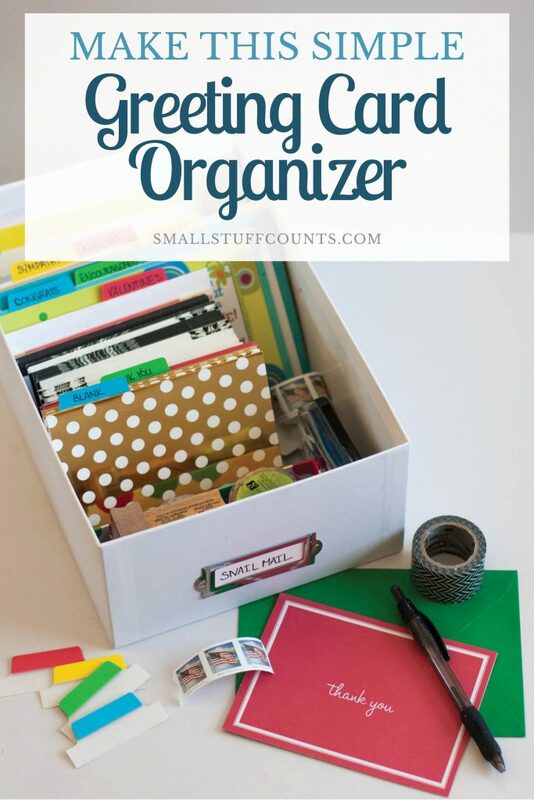 Think small and focus on one tiny thing at a time and your home will be organized in no time! This kit includes a set of four beautiful printable digital files of watercolor cards plus a snail mail supply checklist. You will be sending thoughtful notes to loved ones in no time! Hooray! Your printables are on their way to your inbox. This is a fantastic ideal, thank you so much for sharing. Do have lots of shoe boxes now can put them too good use. 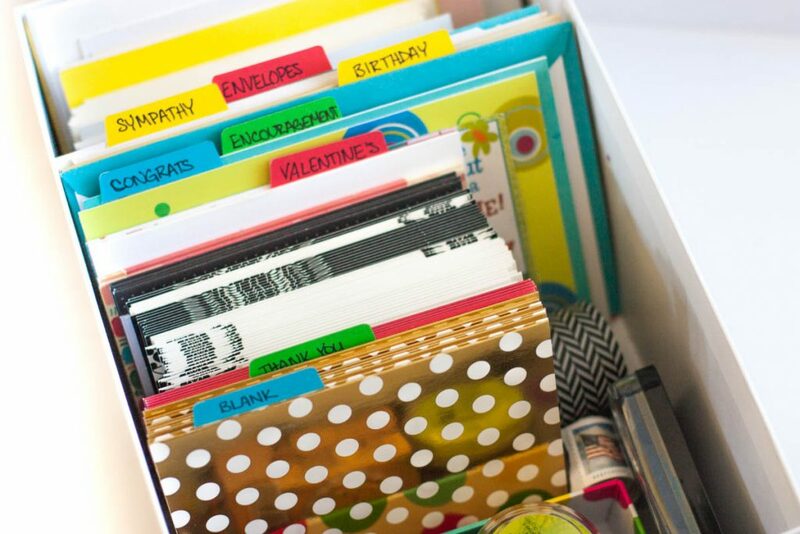 It’s a great way to organize all of your greeting cards!And if you have an extra shoe box already, then it will be super easy to do this project!